the study of culturally induced ignorance or doubt, by the publication of inaccurate or misleading scientific data. The vaccine debate is not all as it seems. Vaccines DO kill and maim every day and you aren’t being told about it! 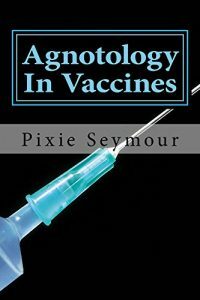 Pixie Seymour is helping to end this culture of ignorance by lifting the lid on the foul practice that is agnotology in vaccines. Find out who’s who and join the dots of the vaccine industry here in Australia and elsewhere (and it’s way more shocking than you think!) She has a background in marketing and natural health and is a mother of four children. Only one is of school age and once she found out what’s in vaccines, she realised that her youngest child is in the firing line. It’s personal for Pixie. This entry was posted in Recommended Books on December 17, 2017 by Editor.